Can you believe January is almost over already? How long did it take to give up your New Years resolutions? With January coming to an end, so is Veganuary… or is it? 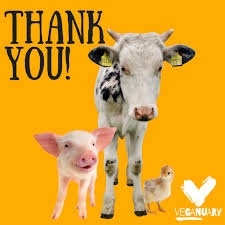 2019 is already looking to be the best year yet in terms of growth for veganism! We’ve had an incredibly promising start to the year with many restaurants adding not just vegan options, but exciting vegan options, to their menus, that aren’t just the standard bean burgers or salads (not that there is anything wrong with them, but talk about samey!) Television adverts have mentioned veganism a lot, whether it be for food or beauty products. Most news stations and talk shows have had guests on to discuss all things vegan. Even Piers Morgan has done nothing but talk about it. The movement is growing and we are excited! We are sure Veganuary plays a huge part in this. Over the years Veganuary has grown massively itself. Below I have included some stats from the amount of sign ups for Veganuary since it began in 2014. 2019 - The official numbers haven’t been released yet. But we do know that a whopping 14,000 signed up on 30th December alone! By the end of the first week in January 225,000 people had signed up. The numbers continued to grow throughout January. The end of January doesn’t have to be the end. Veganuary encourages people to not only try vegan for January, but to help make a lifestyle change, whether it be for your health, environmental reasons or for the animals. If you are thinking of transitioning into veganism then it is always best to educate yourself the best you can, whether it is for the peace of mind that you do not have to miss out on any of your favourite meals, or for the best sources of various nutrients, or even just to find the best cruelty free brands. We have compiled a list of Mummy Meagz top helpful sources to help you along the way. Free Documentaries to watch: Land of Hope and Glory (Animal Welfare), Dominion (Animal Welfare), Cowspiracy (Environmental - Available on Netflix), What The Health (Nutritional/Health - Available on Netflix). Websites: Veganuary (Informative), Plant Based News (Up to date news and advice). Apps: Happy Cow (Places to eat in your area), Bunny Free (Cruelty free brands). Books: Bosh (Cook book), How To Go Vegan (Informative guidebook), How Not To Die (Health and nutrition). We would love to know how you found Veganuary if you participated, and whether you are continuing with your vegan journey! You can get in touch, or ask us for any advice on Facebook, Instagram or Twitter!